Last edited by VinWins on Thu Oct 27, 2011 6:04 am, edited 2 times in total. This is awesome, Vin! Ouch on some of these. Dunn and Morneau, especially. Yeah, better off drafting Kendrys than Dunn this year. Teams drafting our old friend Billy Butler finished first 8 times! Among 1st basemen drafted in all 38 leagues, only Gaby Sanchez never finished last. No team that drafted Aubrey Huff or Carlos Pena finished first. Even Justin Morneau (3) and Adam Dunn (2)were on winning teams. Wow, that is very cool, Vin! Thanks! I wasn't aware that Lyle Overbay's mom had an RCL team this year. In all seriousness...really love this kind of data Vin. Thanks as always. Hard to believe Pujols only brought his owners 2 titles, while Butler brought 8. Of course, I bet Butler got drafted as a CI on many teams. 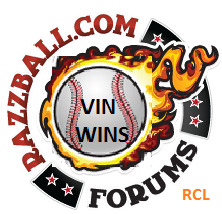 In fact, when you consider that Butler, Napoli, and Kendrick all likely played positions other than 1B for many of their owners, and Kila and LaRoche likely got dropped pretty quickly, it seems like the Vottobomber was clearly the most valuable 1B in the RCLs this year judging by final position of owners, with AGonz coming in 2nd. Definitely, most teams already had a 1st baseman before a lot of these guys were drafted. Shows who the smart guys drafted later. As for Votto, I think he benefited from being drafted later, thus pairing with a better 2nd-rounder. This season, anyways, having a pick in the 1st 4 slots did not pay off. Only 7 of the 39 1st-place teams had a top 4 pick.